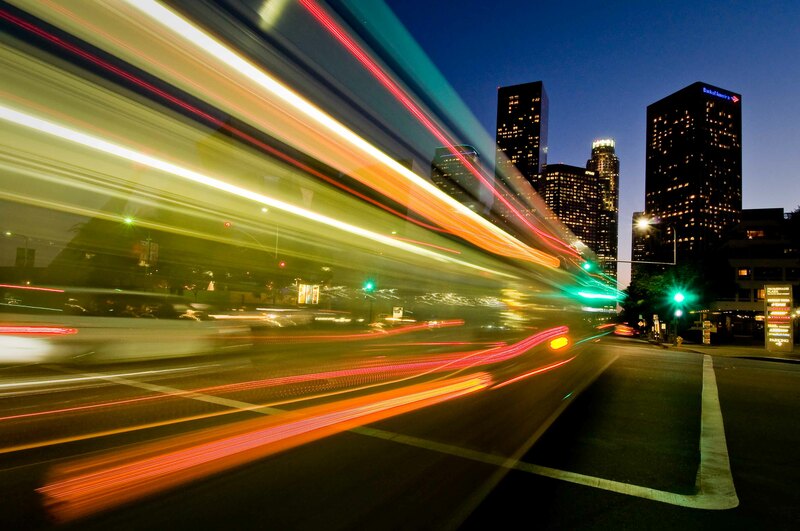 A Metro bus swishes by Disney Hall on a recent evening. Photo by Mark Englert. Mark Englert was in L.A. visiting from Florida and was trying to set up a nice twilight shot of Disney Hall. That’s when, to his surprise, a Metro bus came swishing by, resulting in this sweet shot — and making him glad he was using a tripod. Mark took the shot with a Nikon D300, 12-24 mm lens, at ISO 200, with a four-second shutter release and an aperture setting of F11. Attentive Source readers know that we’re trying to make our site more visual and are hoping to post more photos of transit here and elsewhere. The aim, in particular, is to feature a lot of photos taken by readers — which really shouldn’t be a problem since I suspect most of you have a phone/camera in your pocket while riding transit. What exactly are we looking for? The answer is nothing in particular. The photo should somehow involve mass transit and be eye-catching. Show us something fresh. You can email us your photos at thesource@metro.net but a better way to show off your best shots is to join Metro’s Flickr group, which we regularly check for fresh images. Click on the “art of transit” next to the categories button below my name to see other photos featured recently on The Source.